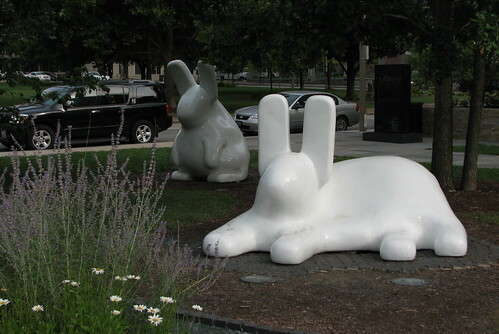 Last week I visited St. Louis to attend the annual Botany conference and present my latest basswood research (and did I rock? Oh yes I did!). My mom went with me for a little getaway and so on the hottest days of the year we found ourselves touring the St. Louis Zoo, the Central West End, and the Missouri Botanical Garden while mopping copious sweat from our brows. On Thursday after she caught the train for home, I did a quick architectural tour of the downtown area, and just for fun I walked to a park called Gateway Mall. 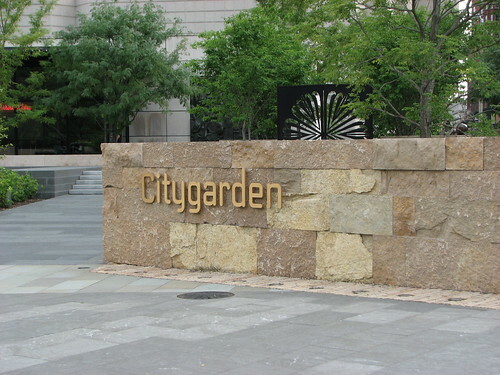 Turned out that it was way better than a park; it was a recently-rebuilt space called Citygarden. 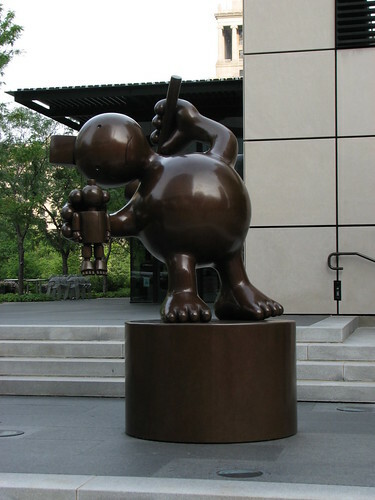 I passed a lovely half hour touring its two city blocks of gardens, waterfalls, and sculptures. 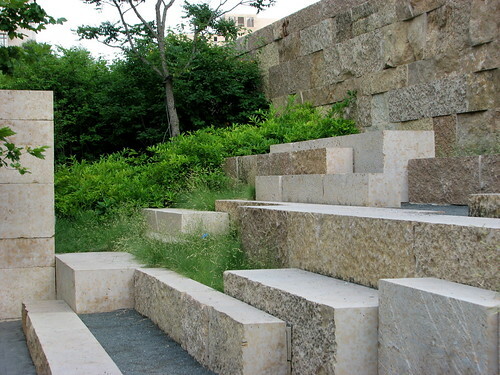 The design is inspired by the geology of Missouri and is laid out in three bands from north to south: the Northern River Bluffs, the Middle Floodplain, and the Southern River Terrace. 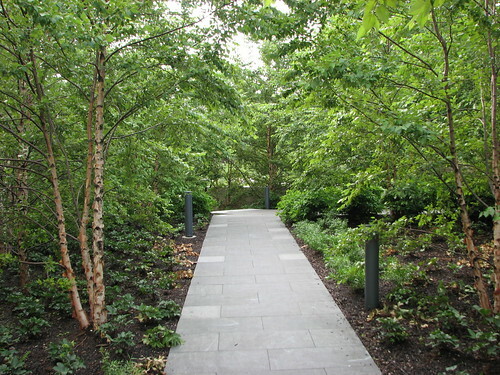 with a forested region whose trees and understory plants, while still young, offer cool shade. There is also a restaurant (glimpsed in the photo below) with a green roof, and a small amphitheater. A waterfall makes the transition from bluff to floodplain. 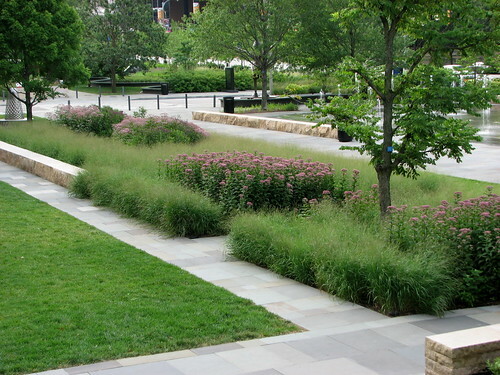 The middle floodplain band has paths paved with black granite and is planted with soft-textured prairie grasses. 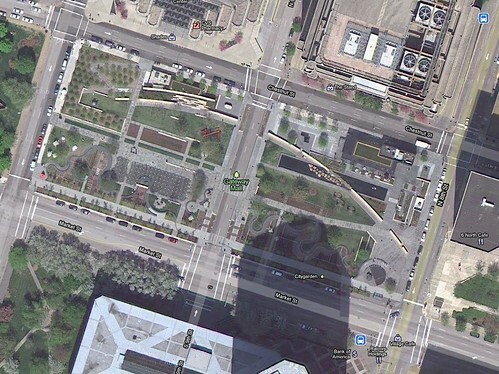 The river terrace is the most landscaped portion and is meant to reflect the fertile, cultivated portions of Missouri. 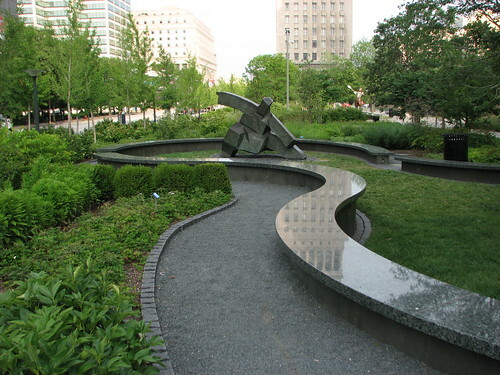 An 1100-foot granite bench meanders through the gardens, suggesting a river wandering across the landscape. 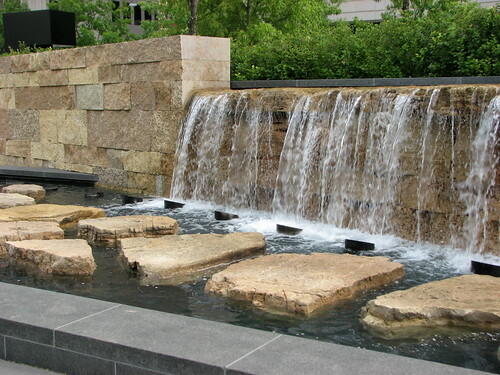 The river terrace also has a huge fountain with mini-geysers of water popping up at varying times. 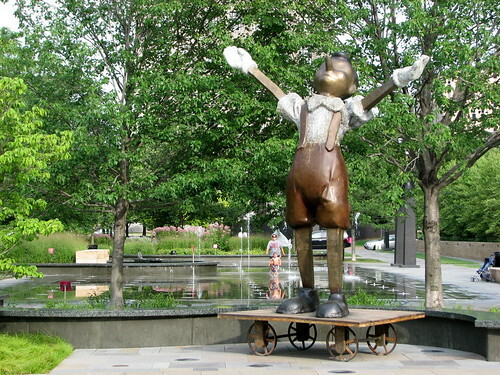 The Citygarden is a cornerstone of the St. Louis downtown redevelopment and I hope that as more people discover it, it becomes as iconic as Millennium Park has in Chicago. It's been a busy summer and I've been letting the garden fend for itself for the most part. 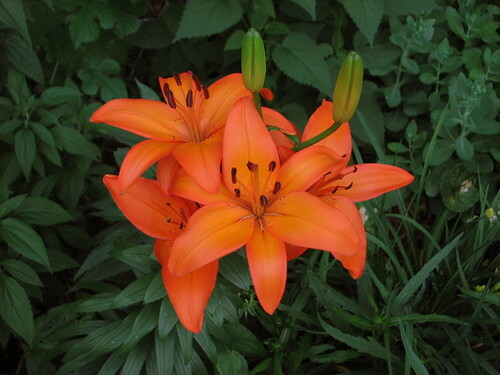 Luckily, the plants know what to do, sometimes a little too well. 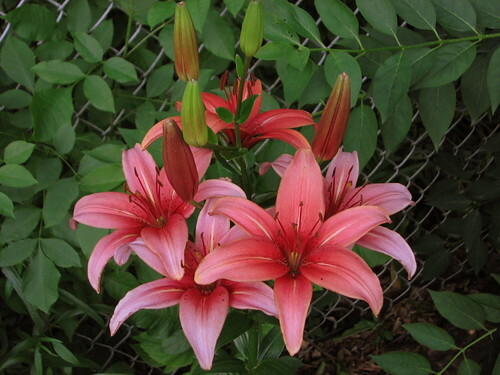 Nothing says "June" like lilies. 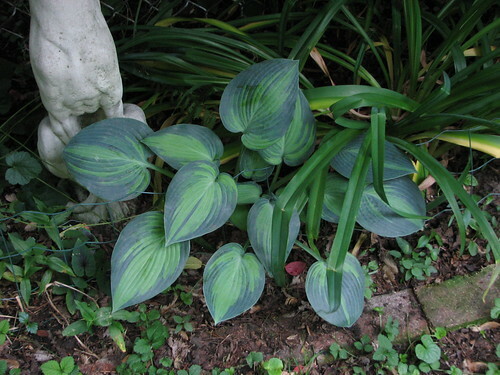 Speaking of June, here's Hosta 'June', the only hosta I ever bought because I liked it and not because I needed a filler in the shade. 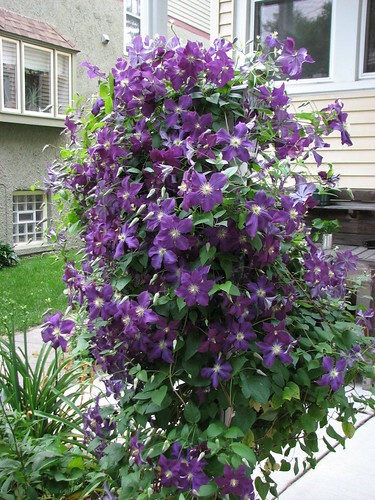 Clematis 'Jackmanii', irrepressible as always. 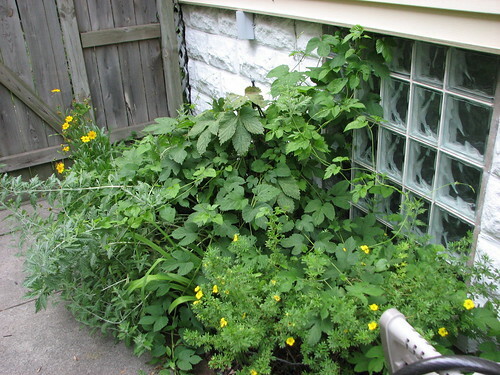 Humulus lupulus, the hops plant I got at the UIC pharmacy garden a few years ago. Somewhere under that mound is a cute little iron trellis. Hahahaha what was I thinking?! Someday we'll wake up and find the entire house encased in hops. 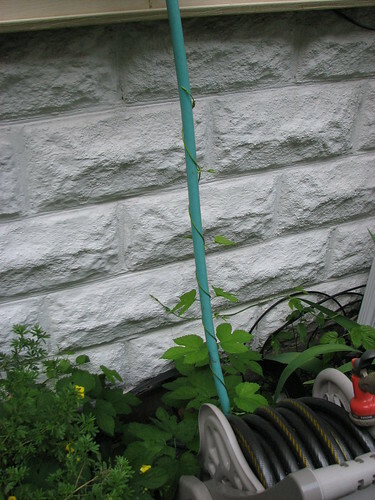 For now it occupies itself with trying to unscrew the hose from the wall.